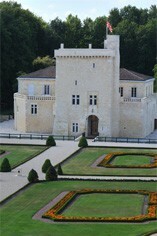 Château La Tour Carnet, a 4emé Cru Classé property, has a long and illustrious history and its wines enjoyed a considerable reputation during the 19th century. La Tour Carnet had a chequered history in the first half of the last century and the wines were mediocre until 1972 when it was bought by Louis Lipschitz. He replanted much of the vineyards and made many long overdue changes to the vinification process. He died in 1979 and the property has since been run by his daughter Marie-Claire Pelegrin. La Tour Carnet has 42 hectares of vineyards in St-Laurent in the Haut-Médoc. The wine is typically a blend of 53% Cabernet Sauvignon, 33% Merlot, 10% Cabernet Franc and 4% Petit Verdot. La Tour Carnet produces dry, medium-bodied, classically made clarets that show at their best with 5 years of bottle ageing.